Featherweight world champion Gary Russell Jr. and undefeated mandatory challenger Joseph “JoJo” Diaz Jr. met members of the media on opposite coasts on Thursday, just one week out of their WBC world title showdown on Saturday, May 19, from MGM National Harbor in Maryland. Russell will defend his WBC title against Diaz in a split-site SHOWTIME CHAMPIONSHIP BOXING telecast (10:05 p.m. ET/PT) and will feature WBC Light Heavyweight World Champion Adonis Stevenson defending his title against two-division world champion Badou Jack in a 12-round main event presented by Premier Boxing Champions from Toronto. Russell was joined by his younger brothers, Gary Antuanne Russell and Gary Antonio Russell at The Enigma Boxing Gym in Capitol Heights, Md., while Diaz took part in a workout at Azteca Gym in the City of Bell, just east of downtown Los Angeles. Tickets for the MGM National Harbor show, which is promoted by TGB Promotions in association with Golden Boy Promotions, are on sale now and are available by visiting http://mgmnationalharbor.com/. “Sometimes you tend to magnify an event because of the fact that it’s in your hometown and it’s on a major card. It tends to take away from the true goal and the true purpose. I just need to focus on what the objective is. We never magnify the events. I think it’s cool that the neighbors and the mail lady and the people who honk their horns as they see me jogging down the street have the ability to get in their car and drive 15 minutes down the road to be a part of everything that’s going on and get to see a product of their environment. “I draw my energy from my family, my friends, the true fans of Gary Russell Jr. That’s what I ultimately do it for. Regardless of what our profession is, we try to have a sense of financial stability for our families and that’s my objective as well. That’s what keeps me motivated. “Diaz already made the statement that I am the best fighter in the featherweight division. He already made the statement that none of the other world champions are willing to step into the ring to compete against me. The managers and the promoters aren’t willing to put their fighters in the ring against me. “I welcome the fact that Diaz wants the fight. As a world champion, I wouldn’t want or expect anything less. I want a competitor that’s ready to fight and that’s going to bring their best. I believe that he’s going to be the best that he can possibly be. My objective is to prepare myself to the best of my ability. I never really focus too much on my opponents. 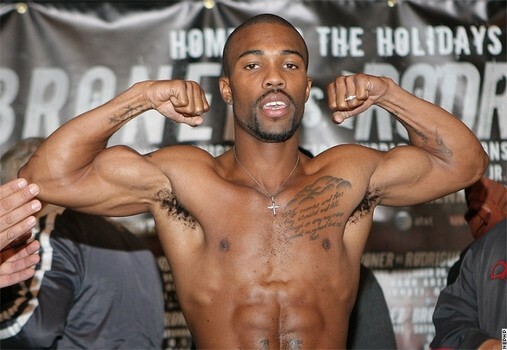 If Gary Russell Jr. is the best that he can be on fight night, then we’re good. “I know that Diaz is young, he’s hungry. He’s the number one contender. He has eight weeks to prepare for nobody else but me. That’s always a recipe for somebody who’s really going to be ready and hungry. I think he knows that he’s getting in the ring with one of the best fighters in the world so he’s going to be ready. “I love what I do. Even when I’m done with the sport of boxing, I’ll still be in the gym training and looking to spar. I’ve been competing since I was seven years old. I’ll be 30, it’s a lot of time that I’ve spent grinding. I just want to be able to spend time with my family and my friends and help give back to this younger generation. “I take my hat off to him for getting in the ring and making this fight happen. You have to appreciate that as a fellow warrior and as a fellow gladiator, I respect it. “I have the strength, the speed, the power, ring generalship, boxing IQ – all of that will come together on the 19th. “I definitely see my hand speed being effective but it’s more than that. That’s just a physical attribute. What happens when you see two fighters who have an equal amount of hand speed and an equal amount of power? It’s the mindset. “It’s always cool to compete with my younger brothers and share the field of battle with them. But I try not to magnify the event. The true focus is being victorious on the 19th. “It’s always important to see my brothers develop, even if it wasn’t on my card. We have a concept of a dynasty. My definition of that is information being passed down from generation to generation. I feel as though when my younger brothers get to the age I am, I expect them to be better than what I am now. The sky is the limit and I want them to keep developing not just as fighters but as men.